Posted by Eddie & filed under Mountains & hills, March 9 2010. Last weekend I travelled to the Lake District in England and walked up to the 931m summit of Skiddaw. This was the first time I’d been hillwaking in the Lake District, so I thought I’d do a straightforward walk, and indeed the summit of Skiddaw, despite being one of the highest in the area, is not difficult to reach, with a clear and well-surfaced path almost all the way up. Above about 600m there was significant snow-cover although crampons and ice-axe were never required. Above about 700m thick cloud meant no views and some navigation with a compass to find the right way, but it was never difficult. 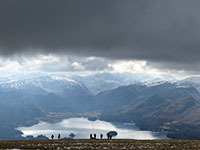 I started the walk at 9am which was a good idea, as the mountain became very busy with walkers as the day went on. 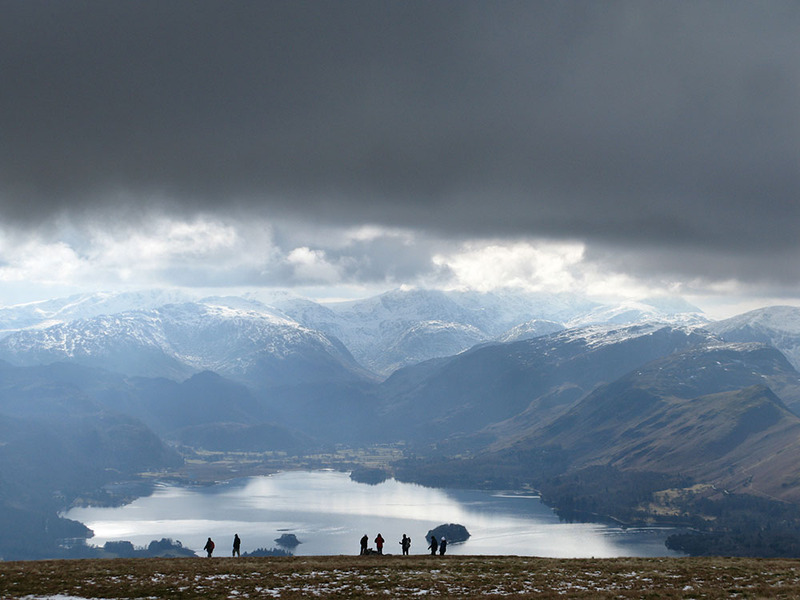 Below the cloudbase the views were magnificent, particularly towards Helvellyn, Derwentwater, Borrowdale and Grasmoor. Really good photo Eddie , beautiful and dramatic. I climbed Skiddaw with my brother,sister and cousin about 20 years ago .. God I’m old .. and it was very busy back then .. oh aye.